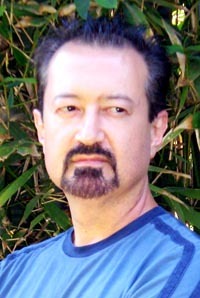 In the waning days of 2011, I received a DVD in the mail from filmmaker Vince Matsudaira. 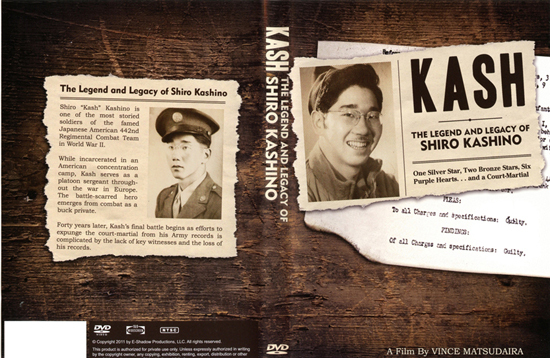 It was the finalized version of his documentary titled “Kash: The Legend and Legacy of Shiro Kashino,” which I first wrote about in this space July 9, 2009. In that column, I wrote about Matsudaira’s work in progress about a 442nd vet named Shiro Kashino, a decorated and well-regarded member of that legendary U.S. Army regiment. For example, while incarcerated at Idaho’s Minidoka concentration camp, Matsudaira relates Kashino telling how he was compelled to persuade his fellow inmates to stage a strike because he thought working on Sundays was unfair. For his troubles, he and his pals were fired. Fortunately, they all later got their jobs back. In a more serious incident, once he was in the Army, SSgt. Kashino angrily confronted a superior officer whose orders to deliver supplies by truck resulted in, he felt, the unnecessary deaths of some fellow 442 soldiers when Germans heard and targeted it via its noise. The incident, according to Matsudaira’s storytelling, would later be a factor in his court-martial stemming from a barroom brawl that he actually tried to stop; the 442 officer he had confronted apparently had a behind-the-scenes hand in implicating Kashino, wanting to teach him a lesson. The lesson meant he spent time in the stockade and was busted down from the rank of staff sergeant to private. While he was no doubt embarrassed, Kashino basically moved on postwar with bigger concerns in civilian life, like getting a job and raising a family. Matsudaira faced many challenges in telling Kashino’s story. In addition to archival, news and newsreel footage, he commissioned an artist to draw scenes for which there were no images. There are also interviews he conducted specifically for this documentary, along with clips from an interview with Kashino himself that, fortunately, was recorded as an oral history by the Sons and Daughters of the 442nd in 1995. Matsudaira said he was inspired to make the movie because he grew up in Seattle and as a boy heard stories of the larger-than-life Kashino, especially after 1951’s “Go for Broke” came out. “The immediate conversation around the house and around the neighborhood was about this car salesman named Shiro Kashino and how he lost his Medal of Honor because he punched a lieutenant in the mouth for calling him a Jap. That’s the story I got,” Matsudaira said, whose elder brother, John, was in A Co. and was wounded in Italy. Of course, the story Matsudaira heard as a kid was a bit exaggerated and inaccurate — but it stayed with him all these many years and eventually compelled him to factually reconstruct the more interesting real-life story of Shiro Kashino that reconciled the legend and what really happened. In that regard, as I wrote back in 2009, “Kash” takes a change of course from being a portrait of someone who lived an interesting life to detective story of how and why Kashino and his family and friends sought to correct a wrong that had happened to him; turns out there were improprieties in the court-martial. 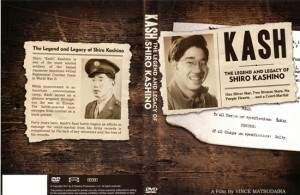 In a way, the drive by Kashino and his fellow vets to correct the record and clear his name is a personal microcosm of the larger redress movement in the Japanese American community: just as it took years for Japanese Americans who had endured the effects of Executive Order 9066 to realize, especially at the prodding of their offspring, that it was something that should not be buried and forgotten, so too it was that Kashino realized that his own daughters deserved to know their dad was not the disgraced troublemaker that the official record portrayed. Also, Kashino seemed to realize that he really did not want his headstone to read that he was an Army private. So, Matsudaira had to piece together the puzzle of existing footage, original interviews, drawings, still photos and more into a coherent story. There were also technical hurdles to overcome, including learning the editing program Final Cut Pro, and aesthetic questions to answer, like whether to use a narrator (which would have made it easier) or use the people interviewed to tell the story. Suffice to say, it was not easy. Also, he got a nice assist from ukulele prodigy Jake Shimabukuro. As the movie closes, his track titled “Go for Broke,” complete with military drumbeat in the background, plays. It was a nice touch. But Matsudaira also had to overcome reservations held by Kashino’s survivors. Matsudaira told me he made a tactical error by sending them an early assemblage of sequences so they could see the progress, even though it was far from finished. He heard rumblings that they weren’t impressed, since they evidently thought this would be the documentary. “I should not have done that,” he said. Hopefully, all the concerns have been assuaged by this finalized version, which premiered Dec. 10 before Japanese Americans and Nisei veterans in Seattle. Now, with the movie completed, Matsudaira has to switch gears in a big way, going from filmmaker to marketer and distributor, getting the word out about the movie, getting more DVDs produced, making a website and Facebook page, entering it into film festivals — it’s a wholly different mindset and skill set from filmmaking. But at least Matsudaira can say he’s completed the movie. He’ll sell the 68-minute long documentary on DVD for, if I recall correctly, $20. I’ll be happy to pass on more news about “Kash” whenever I hear anything from him. In the meantime, if you’d like to contact Vince Matsudaira about buying a copy of the DVD, send an email to me and I’ll send it his way.